The head of the world's largest body of Muslim-majority countries has strongly condemned the bombing of a Catholic church in the Philippines that killed 20 people and wounded nearly a dozen. The general secretary of the 57-nation Organization of Islamic Cooperation, Yousef Al-Othaimeen has also expressed his "deep indignation" at Sunday's terrorist attack. He says the OIC firmly rejects all forms of violence, extremism and terrorism, whatever their sources or motives. Separately, the OIC also welcomed the results of a recent referendum in the southern Philippines, which provides expanded autonomy for the region's minority Muslims in hopes of ending nearly five decades of a separatist rebellion that has left 150,000 people dead. Pope Francis is expressing "firmest reproach" for the twin bombings inside the Catholic cathedral in the Philippines that killed at least 20 people, and is calling for those responsible to change their ways. He also prayed for the dead and wounded during his Sunday blessing, delivered from Panama where he is wrapping up a youth festival. The pope said the "terrorist attack" was just the latest to hit the Christian community in the Philippines. He expressed "the firmest reproach for this episode of violence." He called for peace, for those responsible to change their ways and for serene cohabitation for Filipinos. The bombings took place on Jolo island, where Muslim militants are active. 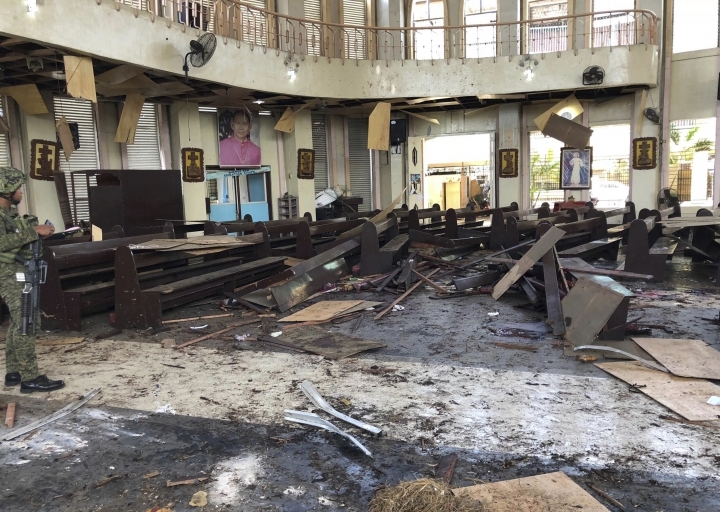 Police say a bombing of a cathedral on a southern Philippine island has killed 20 people, lowering an earlier announced toll that police say was incorrect due to double counting. Police say another 81 people have been wounded in the blast. The fatalities include 15 civilians and five troops. Among the wounded are 14 troops, two police and 65 civilians. Security officials say the first bomb went off in or near the Jolo cathedral during Sunday Mass, followed by a second blast outside the compound as government forces were responding to the attack. Jolo Island has long been troubled by the presence of Abu Sayyaf militants, who are blacklisted by the United States and the Philippines as a terrorist organization because of bombings, kidnappings and beheadings. 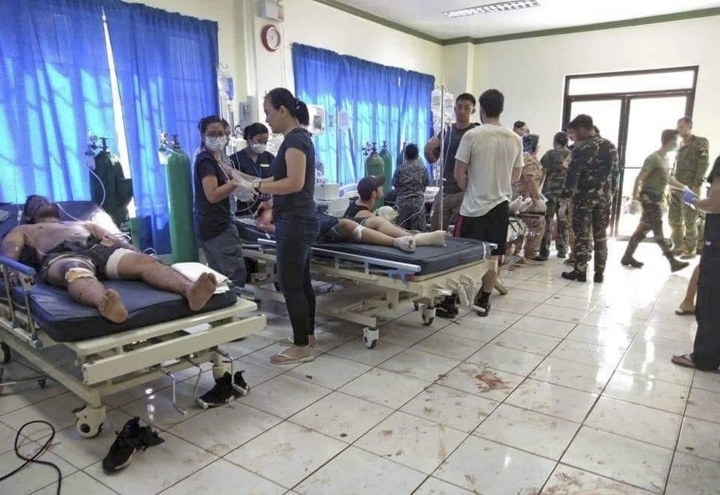 The death toll in the bombing of a cathedral on a southern Philippine island has risen to 27 with 77 others wounded. According to the latest tally provided by regional police, the dead included 20 civilians and seven troops. The wounded included 14 troops, two police and 61 civilians. The government says in a statement it will pursue the attackers "until every killer is brought to justice and put behind bars. The law will give them no mercy." The Philippine government says it will "pursue to the ends of the earth the ruthless perpetrators" behind bomb attacks that killed at least 19 people and wounded dozens during a Sunday Mass at a cathedral on a restive southern island. Security officials say the first bomb went off in or near the Jolo cathedral during Mass, followed by a second blast outside the compound as government forces were arriving in the area. It says authorities are now investigating the attacks. 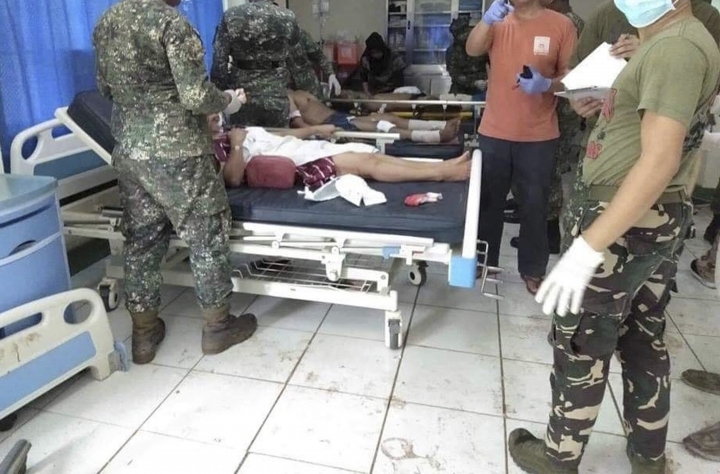 The Philippine national police chief says two bombs that exploded during a Sunday Mass at a cathedral on southern Jolo Island have killed at least 19 people and wounded nearly 50. Oscar Albayalde gave the latest casualty figures as military and police are responding to the blasts targeting the Jolo cathedral. Security officials say the first bomb went off in or near the cathedral during Mass, followed by a second blast outside the compound as government forces were arriving in the area. Philippine officials say two bombs have exploded outside a Roman Catholic cathedral on a southern island where Muslim militants are active, killing at least eight people. 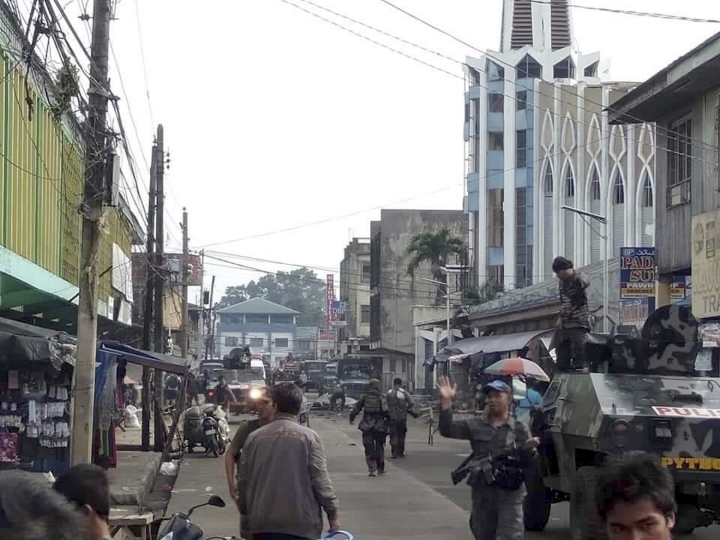 Security officials say the first bomb went off in or near the Jolo cathedral during a Sunday Mass, followed by a second blast outside the compound as government forces were responding to the attack. Police and military reports say at least eight people died, including five troops and three civilians. At least one civilian has been wounded. No one has immediately claimed responsibility.